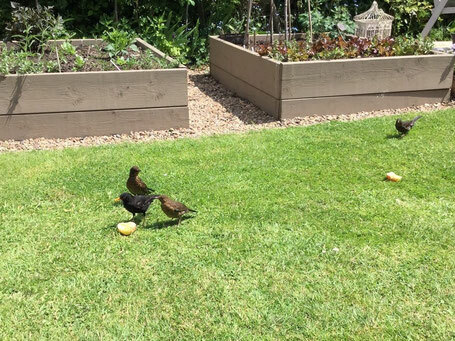 Every day we feed the blackbirds in our garden. They are there each morning on the lawn, awaiting their daily meal of an apple. I cut the apple in two, open the door and begin to step outside. The blackbirds take flight. I know this is how it all works. I put the apple halves on the grass and close the door. After a minute or two the blackbirds are there, taking their fill of the fruit prepared for them. Why do the blackbirds take flight? Don’t they know we are the ones who feed them? Don’t they realise that when their young come I will keep a wary eye out to protect them from the local cats? And still, when I open the door they fly away. I understand this is how it has to be. They have an inbuilt flight mechanism, triggered by movement, and built over generations to protect them from harm. I wish them only good, but still, they move away. In another moment I am standing still by our garden pond. A blackbird comes down the water to take a drink. Then she begins to wash, using her wings to splash water over her. She comes right up to where I am – no more than a foot away. There she begins to preen her feathers with her beak and shake her wings dry. The closeness is all on her terms and I understand this. I must stay still not to disturb her. Refreshed and clean she flies away in the time she chooses. I recognise how – like the blackbirds – it is hard to trust. In their flight I see reflected all the times I have turned away from God’s invitation to me. I see it in others too. Yet God understands this is how it will be – for now – at least. We are not yet free of fear. Some of us have known harm in our past, and learnt to be on the alert, and fly at the first hint of danger. Unsurprisingly, we hesitate to put too much trust in God when she draws near, or trust her when she invites us to let go and find rest. Yet God persists in putting out the apple, day upon day, and allows us to move away to where we feel more comfortable. Until a day comes when it feels just right to draw close – and the fear, and the past harm begins to slip away. I will go on putting out the apples without asking or expecting any more...delighting in their company when they choose to draw near. Could God be like this: so generous, patient and persistent? Is that other God of demand and fear a projection of all that is wounded and wounding in humankind? What might happen if we dared – in spite of our fears – to act as if it were so?